Electronic developers are frequently tasked with adapting parallel PCB connections to a wide range of spatial requirements. With ept’s One27® SMT PCB connector, which has a pitch of 1.27 mm, the distance between any two stacked PCBs is variable by up to 5.8 mm. This flexibility is provided by two factors: On the one hand, both the male and female connectors are available in low-profile and mid-profile sizes. On the other hand, the profiles can be freely combined, which means the board-to-board distance can be as low as 8 mm and as high as 13.8 mm. This wide range is made possible by the wide secure-mating distance of the One27® connectors. The connection between any male and female connector remains secure up to a distance of 1.5 mm. 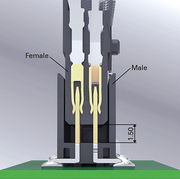 Secure mating between the male connector’s contact pin and the dual beam contact of the female connector is ensured by the remaining 0.9 mm of contact distance. The maximum achievable board-to-board distance when using a mid-profile male connector with a mid-profile female connector is therefore 13.8 mm. On the other hand, when a low-profile male connector is plugged all the way into a low-profile female connector, the board-to-board distance is only 8 mm. Thanks to right-angle male and female connectors, the One27® SMT connection system can also be used to create right-angle and horizontal PCB layouts. In addition, IDC male connectors make it possible to connect ribbon cables to the PCB. All connectors from the One27® range are available with pin counts of 12, 16, 20, 26, 32, 40, 50, 68, and 80. 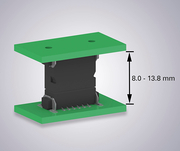 The connectors have been demonstrated to be fully compatible with common 1.27 mm-pitch SMT connectors from other manufacturers.